In 1924 a young Indian elephant appeared in the British Empire Exhibition held at Wembley in London. 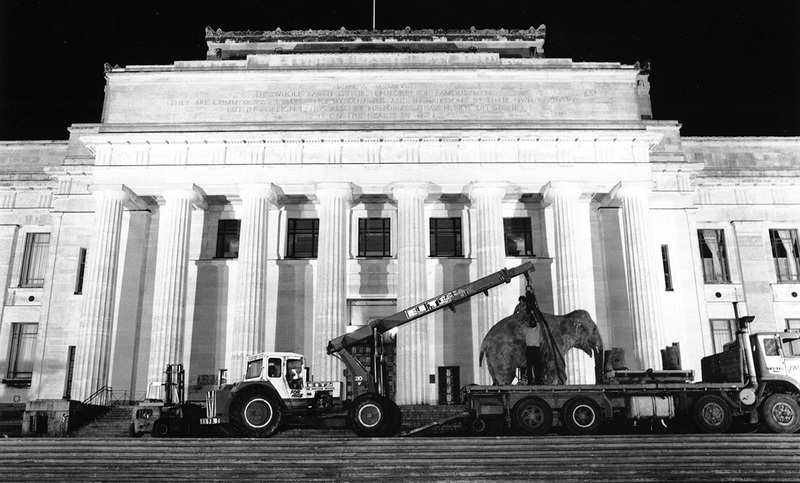 This was the elephant’s first stop in a journey that would finish at Auckland Museum, where he’d become one of the Museum’s most-loved exhibits. In 1925 the elephant was shipped to Beaumaris Zoo in Hobart, Tasmania, where he was known as ‘Jumbo’ and gave children rides around the zoo. 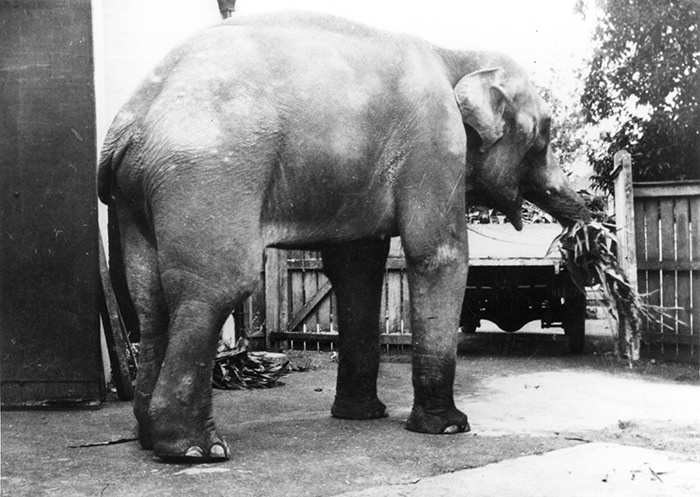 Then in 1930, during the Great Depression, Auckland Zoo paid £125 to Beaumaris for the then 13-year-old male elephant, who would become known as ‘Rajah’. As any captive wild animal would be, Rajah proved difficult to control. Sadly, the zoo could not cope with Rajah’s behaviour and he was shot in March 1936. At the time Auckland Museum often collected animals that died at the zoo, and so it came to be that Rajah entered the collections of the Museum. The Museum’s skilled taxidermist Charles Dover and his assistants then spent seven months preparing the elephant as a mounted exhibit – no easy task given that Rajah’s species, Elephas maximus, is one of the largest living land animals in the world. In October 1936 the reincarnated Rajah went on display in Auckland Museum’s Hall of General Natural History, where he remained for 58 years. By the late 1980s Rajah’s condition had become a little worse for wear so he was assessed to see if he could be restored. It was decided to store Rajah off-site until the Museum had the appropriate tools and experience to restore him. 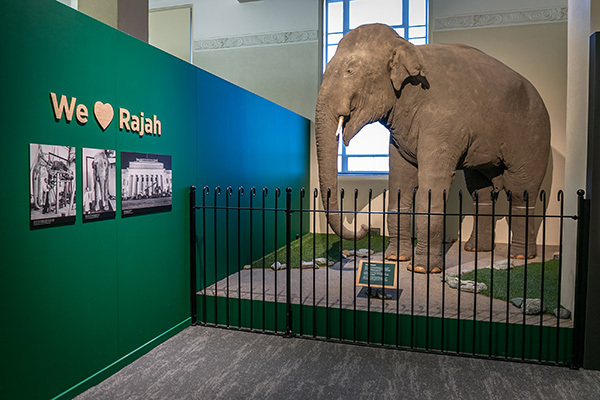 In March 1994 Rajah left the Museum, but he did not quite fit through the door – this height issue was fixed by cutting off his legs and trunk. The morning of his departure saw a small crowd gathered to hear a speech from the Governor-General, Dame Catherine Tizard. 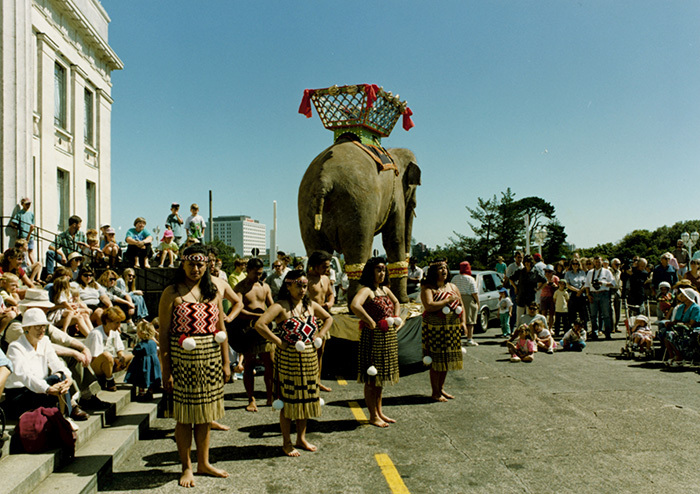 Then an Indian dance troupe circled Rajah on his mounted trailer before he set off down the hill to the farewell strains of ‘Haere Rā’, sung by the Museum’s Māori cultural performance group. 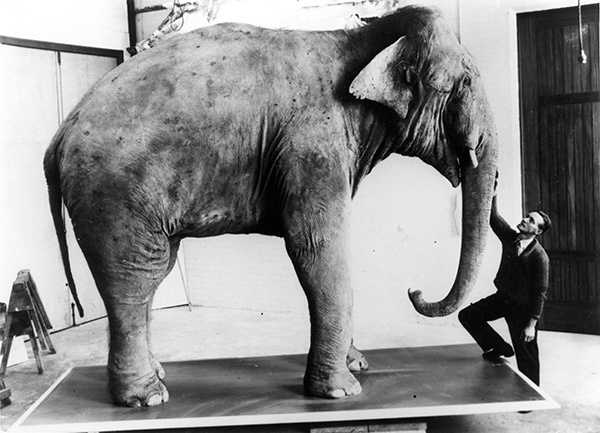 In the late 1990s the Museum employed a preparator who happened to have experience in restoring museum elephants – finally Rajah's appearance could be improved. Over 10 weeks, David Weatherley cosmetically restored Rajah by remodelling his damaged ears and fashioning replicas to substitute for his then missing tusks and tail, which had been stolen. Rajah brushed up well and was displayed in the Wild Child gallery from late 1999. By 2018, new cracks were evident and Rajah was taken off display for conservation work. Rajah, the 100 year-old elephant, can now be found in his new home in the Origins Gallery. Rajah in the Origins gallery.